According to the International Atomic Energy Agency (IAEA) the greatest danger to nuclear security comes from terrorists acquiring sufficient quantities of plutonium or highly enriched uranium (HEU) to construct a crude nuclear explosive device. The IAEA also notes that most cases of illicit nuclear trafficking have involved gram-level quantities, which can be challenging to detect with most inspection methods. According to a new study appearing this week in the Journal of Applied Physics, coupling commercially available spectral X-ray detectors with a specialized algorithm can improve the detection of uranium and plutonium in small, layered objects such as baggage. This approach enhances the detection powers of X-ray imaging and may provide a new tool to impede nuclear trafficking. The study was conducted by a joint research team from the University of Texas at Austin (UT) and the Department of Energy's Pacific Northwest National Laboratory (PNNL). "We first had to develop a computational model for how X-rays move through materials and how they are detected so that we could predict what an image will look like once the radiation passed through an object," said UT's Mark Deinert, one of the authors on the paper. "With that in hand, we applied an 'inverse algorithm,' varying the composition of the object until the predicted image matched the measured one. We also gave our algorithm additional details about density and other factors a process called 'regularization' to adaptively enhance its ability to discriminate materials." The new system, Deinert said, expands upon techniques originally developed for medical applications such as discerning between bone and iodine contrast agent in an X-ray image. 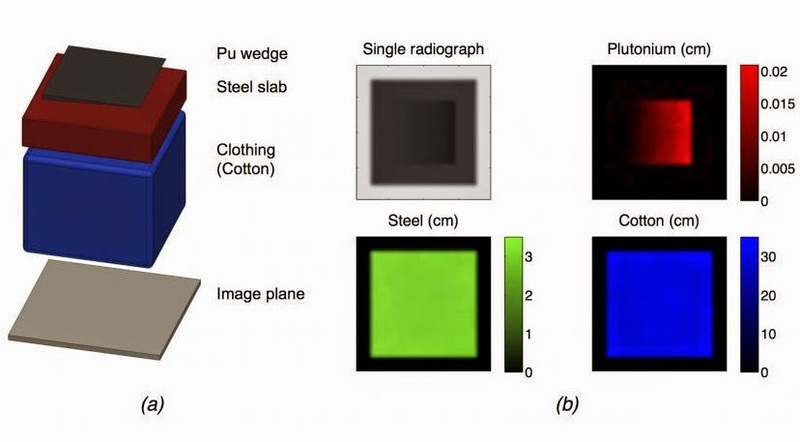 "We wanted to show that spectrally sensitive detectors can be used to discriminate plutonium and other high-atomic-number elements from multiple layers of other materials using a single-view radiograph," said Andrew Gilbert, the lead author on the paper and a doctoral student of Deinert's working at PNNL. "In simulated radiographs, we were able to detect the presence of plutonium with a mass resolution per unit area of at least 0.07 gram/centimeter squared; in other words, we can locate a sample of plutonium with a thickness of only 0.036 millimeters." Now that the inverse algorithm method has been shown to help X-rays detect nuclear materials in luggage and other small objects, Deinert said that his team will next expand the concept to improve detection on a larger scale. "We plan to apply the algorithm to high-energy X-ray systems that could be used for verification of arms-reduction treaties," he said.